NickGeorge: I won this handicap game pretty handily,but this invasion lived, and I don't think it ought to have. I can post what I did, if it's helpful, but what's the best way to deal with this? I held white to a meagre life- 3 points of territory, but I think I should have killed. Harleqin: How about descending (sagari)? Then I find it difficult to find a white move there that black can not ignore. Phelan(16k? ): I think Harleqin means at b. Phelan(16k? ): A one point jump seems good enough to me. It limits white's eye space, and no, you shouldn't have problems with the cuts. Even with the sequence up to 3 it seems you should have no problems. The marked black wall will help you attack any attempts to make eyes. I'd like to see how the rest of the invasion went. unkx80: The way to deal with these kind of "impossible" invasions is not to give White any chance of sabaki. So descents like b above (in response to ) is good. 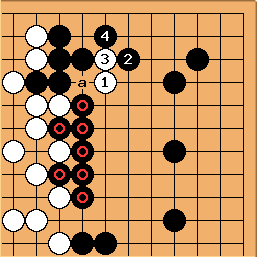 The marked black stones are very strong, so I don't think white can escape. If white cuts with at a, you can play at . Harleqin: I object to that. The cut may not work for now, but after some pushing and shoving it may somehow come back to haunt you. White doesn't have enough space to live anyway, so the best course is to eliminate your weaknesses and connect! The same holds for the answer to in the first diagram. The hane may hold, but White does get chances when he crosscuts. Alex: Right. This is why these invasions sometimes work out in high handicap, high kyu games. isn't a fatal mistake, but the notion that it provides stronger resistance than then simple connection of in the game diagram is flawed. As long as Black keeps things as simple as possible and avoids things like crosscuts, double hanes, etc. there isn't much trickery White can get up to. , , and are all safe, uncomplicated moves, and allow White no chance to make eyes. White might try to bully the corner a bit with , but puts an end to that. Perhaps is too complicated for a beginner, though. I wouldn't recommend playing it if you can't read out that it guarantees a connection (it only requires reading maybe three moves deep or so). In that case, a would also be okay. It lets White push through at which is usually bad shape for Black, but here Black is so strong there is no danger. Thad While it makes sense not to make things complicated, one of the surest ways to lose in situations like this is to make the simplest moves. One way to make such an invasion survive in a kyu game is to leave behind aji when defending. 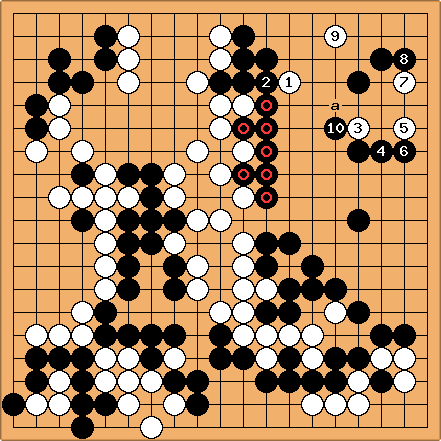 Another way is to respond with moves that are aji keshi but allow the opponent to get fake kikashi in. At the very lest a move like 2 should be considered. When pressed hard with and the upper half of the wall can live independently. At the same time becomes heavy. Something that is very useful in handling such invasions is to make sure that individual parts of your framework can live independently. Harleqin: ...which they don't need when they just stay connected. Of course in general it is a balance ( as all things in Go are ). A too passive approach will lose the game for you, a too aggressive approach will also lose. The way to get better is to find the right balance. Alex: Sometimes strong resistance is called for. If the opponent's moves are clearly unreasonable, though, then all you need to do is not make huge mistakes. The best way to avoid huge mistakes is to make the simplest moves. Of course, in this position, Thad's way, my way, Phelan's way... almost anything you do should end up with White dying a natural death. It's difficult to prove which one is the least likely to lead to a blunder. However, in general, my observation is that when unreasonable invasions live, it's usually because the defender tried too hard, not because he or she didn't try hard enough. Resisting every kikashi, cutting everywhere and trying to kill the invading stones as quickly as possible is usually what lets the stronger player get away with something sneaky.